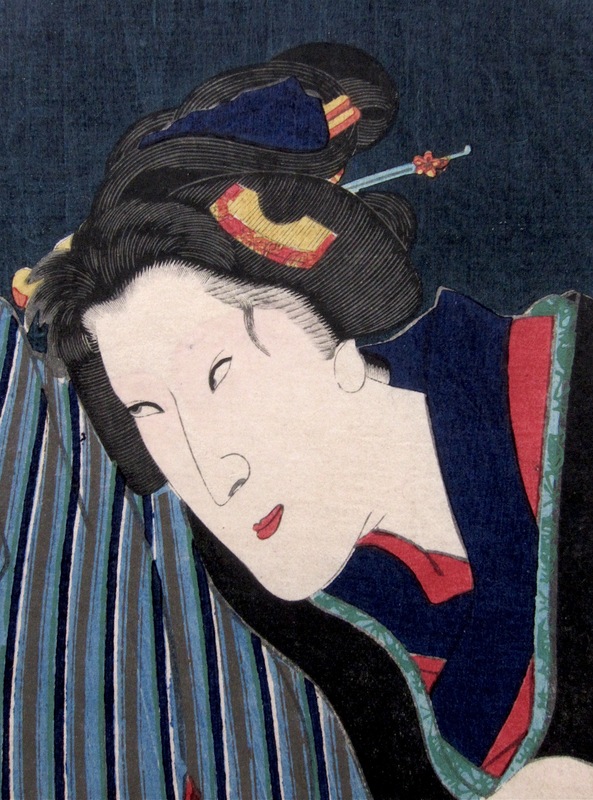 Utagawa Kunisada/Toyokuni III (1786-1865) Story of a Chivalrous Man in the Theatrical World (Rien Kyokaku-den): Onoe Kikugoro II as Kisaburo nyobo Oiso, 1863. Deluxe Oban. Horst Graebner on his definitive site The Kunisada Project describes this series as “A very fine late half-length actor portrait series by Kunisada”. It is indeed a very fine, deluxe series and very highly regarded by collectors. The series features outstanding double printing, and many deluxe techniques which impart a great depth and subtlety to the shadowy images. The series is signed with a late Kunisada version of the Toshidama seal and the words, "drawn by the 78 year old Toyokuni". 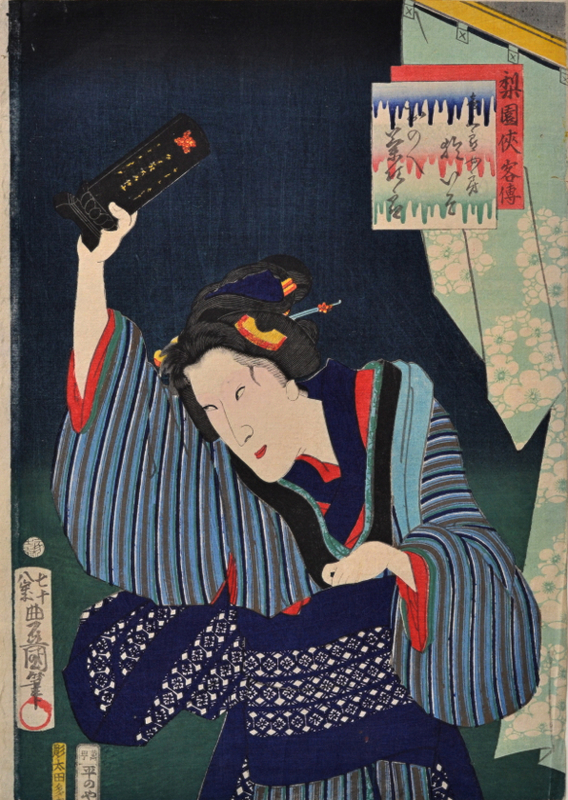 This print shows kabuki star Onoe Kikugoro in an onnagata role as Kisaburo nyobo Oiso, caught mid-scene throwing a statuette. A superbly rendered image in a near monochrome palate, with carefully graded bokashi shading and mica applied to the top margin. The colour here is rich and superb, from the first edition and full size with intact right hand margin. Very fine condition. Signed nanajuhachi sai Toyokuni hitsu with Toshidama. Published by Hiranoya Shinzo.